Tribes Service: "Paul was very helpful bringing our ideas into reality. The special little touches, for example, on my seventieth birthday a surprise was laid on by the owners Amanda and Guy and Paul our representative. " Social & Environmental Responsibility: "Costa Rica has an environmental approach which should be a template for all countries to adopt in protecting their environment"
Nice hotel in the hills above San Jose. Quiet, just what is required after a long flight. What can I say, that has not been said before, superb, superb, superb. The large room with it's view of the Pacific Ocean overlooking the small pool, The intimate atmosphere created by the owners with their hands on approach was exceptional. The food was of a high quality, although we felt the ordering of our meal ahead of time, I.e at Breakfast for Lunch, I.e. at Lunch for Dinner was not necessary. But that is a small grumble.The staff had been trained to a very high standard with emphasis on personal interaction with their guests. Superb small hotel, very quiet. 12 adjoining bungalows overlooking the river. Very good food, A la Carte menu. Excellent guides, small boats for touring the hidden canals, usually by ourselves with guide. "We had asked Tribes to build a trip that took in as much of the natural environment of Costa Rica as possible. This they delivered in spades. 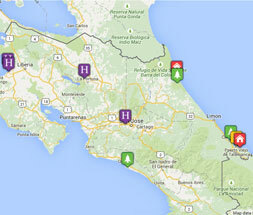 We covered almost every climatic zone that Costa Rica had to offer. The wildlife in particular at times was spectacular with Tortuguero and the Osa Peninsula offering the most diverse animals and birds."